'Liberate More Abundance' By Getting Your Business To Thrive! Work with us as your Business Coach to take you and your business to the next level! Are you ready to increase your sales, cashflow or profits? Are you ready to manage and lead a better team for higher performance? Are you open to systemising your business to free up more time? “Hold Your Horses!” First, We Want To Examine With You, If Our Business Coaching Services Can Deliver A Positive Return? “Why would you ever consider working with a Business Coach, unless you knew it was going to give you a positive return on your Investment in time and money?” That is a fair and very pragmatic question you should be asking yourself and any Business Coach you speak with. We believe in conducting and delivering practical advice, based on sound business ethics, that will deliver a positive return on your investment in money. In fact, we will ‘ONLY OFFER’ to work with businesses, on a 0ne-to-one basis, when we know we can achieve a positive ROI within 26 weeks. That is part of our LibAbun Guarantee. To correctly make that assessment, we will conduct with every business in our target market interested in our one-to-one Business Coaching services, a complimentary ‘Business Growth Audit’. This is a 2-hour in-depth assessment of your Business Goals, current business activities and your business development strategies to identify all your business development opportunities to grow your business in accordance with your goals and ‘YES’ it’s totally free. At LibAabun we believe, “The best way to determine and show if we can help Small Businesses, is to actually help them! That’s what we call a win/win/win situation. If we identify enough business development strategies during the ‘Business Growth Audit’; and we can demonstrate to you how one of our Business Coaching programs will be a ‘profitable strategy’ for you and your business; ONLY then will we offer to work with you and recommend the best program for you. One-to-one Business Coaching is the best program offering the fastest results for businesses of a certain size. 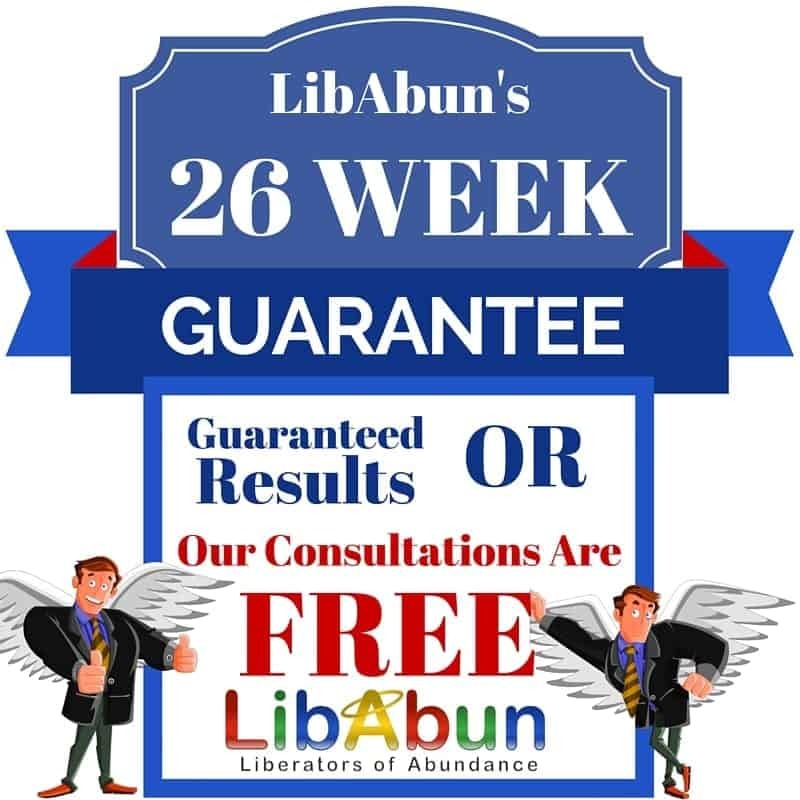 What’s even better is that, if we agree to work with you, we offer you our LibAbun 26-week guarantee to deliver profitable results for you. Target Market: Businesses that are suitable for our one-to-one Business Coaching have Owners/Managers who have an open mind about working with a Business Coach. They have annual sales of around £300,000 or more. They have a team of 3 or more people and these Businesses are looking to take their results to another level… Note: If you do not meet any of these traits, we do have other Business Coaching/Support programs that will cater to your needs. Please contact us to discuss. We will help you transform your business results by working with you, and when necessary your team, to get everyone operating your business in a much more focused and structured manner that delivers results and you will feel great as you go through this transformation. From helping you create business and marketing plans to implementing specific strategies, our one-to-one business coaching sessions allow you to work directly with a ‘LibAbun Business Coach’ to understand your company and create the strategies that are needed for your unique business. Check out some of our ‘Success Stories’ with Business Coaching Clients. Implementing a business planning system into your business with your team that includes Annual, quarterly, monthly, weekly and daily planning to really accelerate results in your business. Implementing a CRM system into your business and how to correctly use it to maximise results in your marketing, sales, customers services and business reporting processes. Further Marketing, Sales and Systems critiques as stipulated in each program. The LibAbun business coaching programs are designed to grow your business, systemising it as you grow, save you time, whilst improving your productivity and increasing your sales and cashflow whilst accelerating your profits.